We don’t have many mountains in Western Australia. One of the more accessible mountain ranges is the Stirling Ranges between Perth and Albany. It is situated around 400km (around 250 miles and 5 hours drive) away from Perth (the capital of Western Australia). Bluff Knoll is the highest peak in the Stirling Ranges in Western Australia. It reaches 1099m above sea level. Hiking up Bluff Knoll during the day, I personally decided that I’d rather not climb up/down it at night with all my camera equipment. The hike itself is only about 6km return, but it’s a stair climb almost all the way to the top with some cliffs off to the side. During the daytime, I used a combination of Photopills and Skysafari to compose how the Milkyway rising would show against the Knoll. The augmented reality view gives an immediate idea of how it falls. Photographing a panorama of Bluff knoll at sunset gave me an idea of how the light hits the side of the Knoll at sunset. This more or less gave me an idea of how a setting moon would light the scene. It lit the mountain side and also the other peaks receding off into the distance. Getting to the location pre-dawn gave me an idea of what it was like in the dark and also what it would look like with a rising crescent moon. 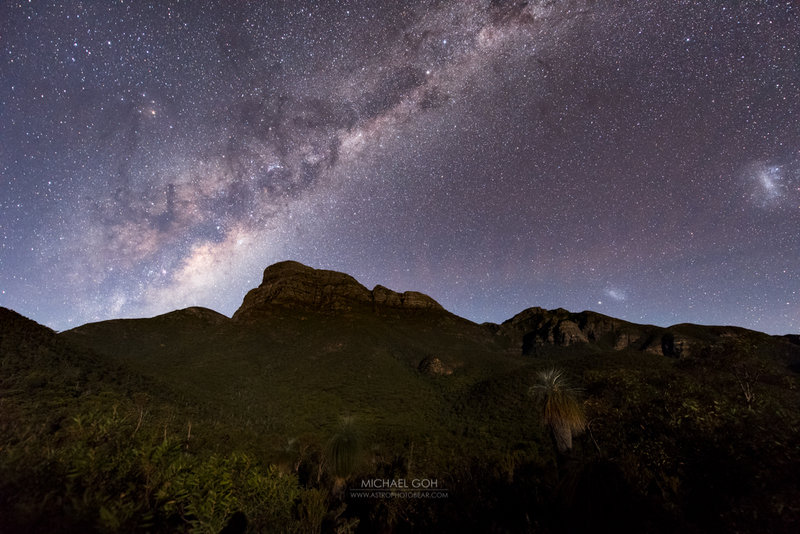 Bluff Knoll is pretty dark (the surface) so star light by itself would struggle to show any detail, so my preference was crescent moon light. The angle of the face of the mountain meant that the sun (at that time) didn’t light it up – therefore a rising moon would not be useful in lighting up the scene. So in preparation for a shoot, I did a quick mock composite of what I was after. 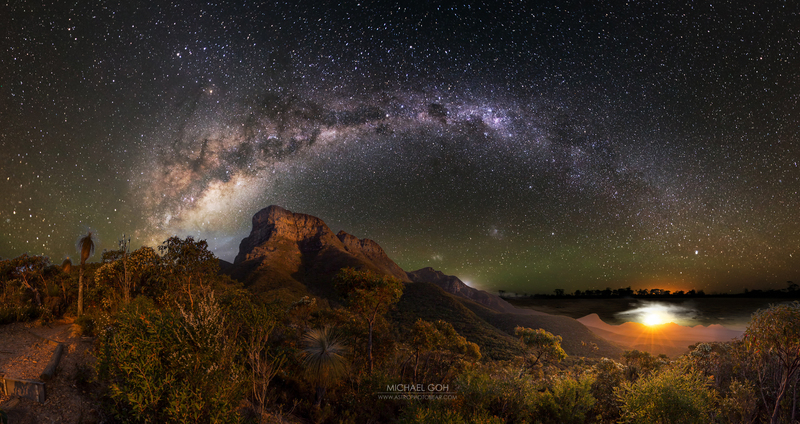 Armed with the information from this trip, I planned for a setting crescent moon to the West with the Milky Way core rising to the left of Bluff Knoll. Getting closer to the dates that I’d marked – the excitement of anticipation rose, especially with the forecasts of some light cloud (I like some cloud in my astrophotography as it adds another element). Night one – this was the preferred imaging night with the moon luminosity at about 20%, but it would dim as it got closer to the horizon. The setting moon would be fairly close to the rising milky way core. I setup 3 cameras, 2 timelapsing and 1 for normal imaging. The moon was still pretty faint, but the higher exposure capacities of the full frames brought out the detail. It would have been nice to have had some light cloud to add to the timelapse, but it wasn’t to be. There were some hikers that came down from the summit after dark and it was interesting seeing their light come down from the summit. During the timelapse – a friend of mine turned up to the location – Dougal Topping. Night two – more timelapsing. This was not a preferred night to shoot as the moon was going to be at 30% luminosity. I knew from experience that the lunar brightness would cause wash out some of the Milky way core and the sky would be bluish till the moon set. The ideal imaging time to a smaller window when the moon was setting and be bright enough to light the side of the mountain, yet dim enough to allow for some core detail. On night two – I had the company of Dougal and we were joined by Sandino (Dino) Pusta. Panorama image (I did image more than just the single panorama). Thinking about how it came together, it does make me think again about the lens compression with having the mountain right in front of you. 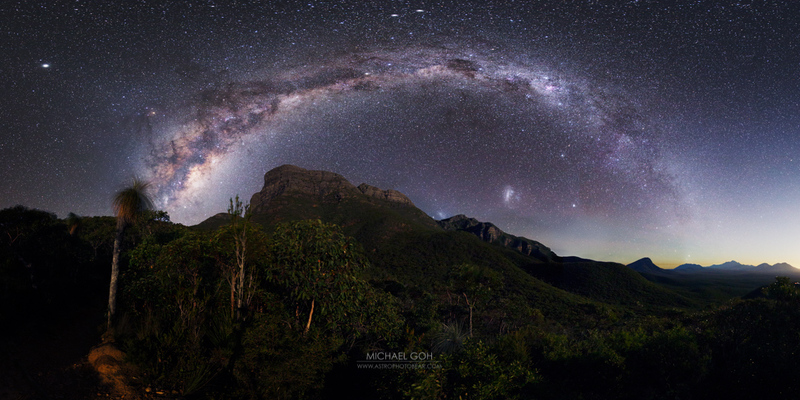 It depends how large you want the relative size of the mountain vs the Milkyway core. The core was certainly massive in the sky, however being really close to the mountain also was very large. In contrast, have a look at how large the MW core was in the timelapse when much further back (500m or so) from the mountain. I would have liked the MW core higher up in the sky however, this would have only been possible once the moon had set, then the rest of the foreground would have been dark. Compared to the previous panorama that I took during the day, I think it was a bit more overgrown in some areas, so I didn’t stand in the same spot. I guess it’s also a little intimidating in the dark with some drop off from the path – safety always comes first. Timelapse at the location – using Canon 6d and Nikon d810 with a Timelapse+ View and Syrp genie mini. Micheal your photos are sensational. Well done.